Has anyone here tried StitchFix yet? They recently sent me one of their winter boxes and I’ve partnered with them to share my experience with the service. For those of you that don’t have time to shop or live in areas where you don’t have a ton of shopping options, StitchFix is a such a treat! You get your own personal stylist, who based on your preferences sends you a mix of 5 items every month. All you have to do is take a short quiz and share your style preferences! I am sharing my outfits below received from my most recent box and some tips about how to get the best possible fix for you. 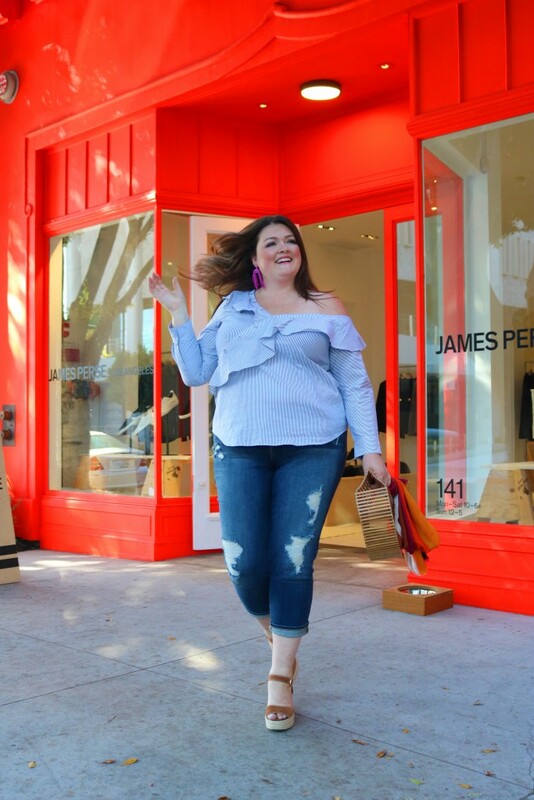 PLUS Stitch Fix carries plus sizes in over 150 brands including Eloquii, City Chic, Rebel Wilson X Angels, Slink, Liverpool, Kut From the Kloth, JCrew Mercantile, Madewell, Good American, Mavi, NYDJ, Calvin Klein, Tahari, Nike, Daniel Rainn, Calvin Klein, Vigoss, Vince Camuto, Tahari, Karl Lagerfeld Paris, Junarose, and more. Let’s jump into look one. I told my stylist I wanted some cold weather items and some layering pieces. She sent me for look one, these cropped jeans and this off the shoulder top which I paired with my own accessories. Since its usually pretty warm during the day in LA, this look was perfect for running errands. Next up, I styled more of a cozy look for when the temps drop in LA. 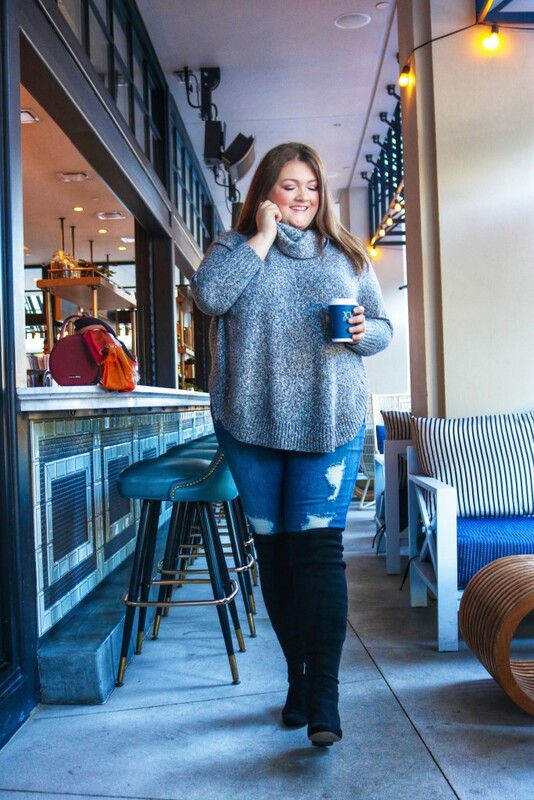 That is the beauty of StitchFix, you can always tell your stylist specifically that you’d like them to focus on coats, or long sleeve tops or sweaters or a specific event you might have coming up. I also recommend pinning a bunch of ideas to a Pinterest Style board to share with your stylist! It takes a few minutes but really spending time giving your stylist specifics will only help you get the best fix! For example, in addition to my pinterest board, I sent specific links to styles I was loving and wrote out requests like ” I need a jacket like this for colder temps when I travel.” Another cool thing to know is that StitchFix also offers accessories like footwear, jewelry and scarves to really polish off your look. Last up, I asked my stylist for a winter jacket for those times when I travel to a cooler climate or the temps really drop at night in LA. She sent me this gorgeous single breasted coat with waist tie in a classic print which I loved. I paired it with this cute plum colored sweater to finish off my look! So, what do you guys think? If you are even slightly on the fence about StitchFix, now is the time to try it. Basically, there is a $20 stylist fee BUT if you even keep one item, they apply that fee towards your item. So, its like getting $20 off automatically. IT GETS BETTER THOUGH – If you KEEP all 5 ITEMS, you get 25% off your order so you actually end up saving by bundling. So your first fix is really risk free. What are you waiting for?!? Get your customized box today. Yes, do it and they are offering some pretty good risk free trials now. What styke of jeans are you wering with those black otk boots? I have a pair of those boots but don’t think my skinny jeans would fit in the boots.